A British publisher, Karl Sabbagh, has launched a scathing attack on the way the Israeli lobby in the UK sabotages attempts to present the Palestinian case against Israel. He described organisations like the Board of Deputies, the Israeli Embassy, and Zionist bloggers as ‘enemies of truth, determined to ignore the facts, in case people understood the true merits of the Palestinian case.’ He also criticised Theresa May’s support this week for a new definition of antisemitism which, he said, made the British government like an arm of the Israeli Embassy PR department. The irony of calling antisemitic anyone who criticises “a Jewish collectivity” is that the Israel government, with a population of Arabs, Muslims, Christians and Jews insists that it is “the Jewish state’, thus making it by definition uncriticisable, whatever it does. Sabbagh’s speech was at a private meeting in the House of Lords on Wednesday, December 14th, hosted by Baroness Jenny Tonge, whose remarks on Israel and Palestine have been attacked by the Israel lobby in the past. At a meeting chaired by her in October, a rabbi made barely coherent anti-Zionist comments which were misreported in the media as coming from the official speakers, for which Baroness Tonge, as Chair, was accused of being responsible by the complainants. 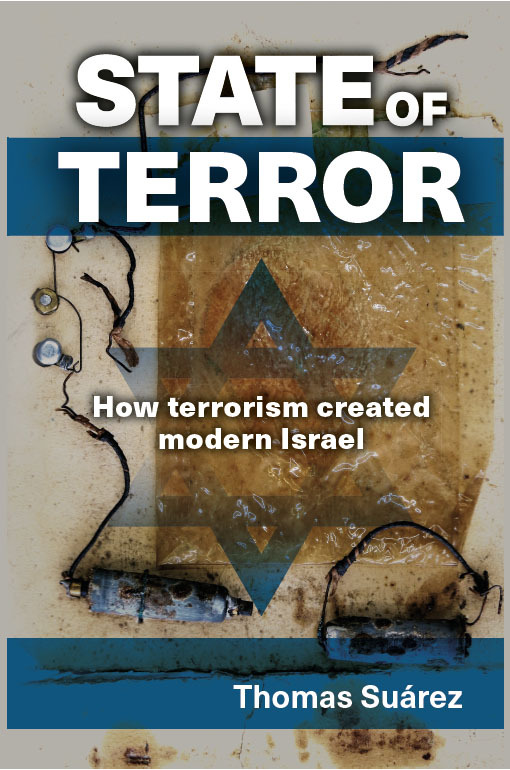 The occasion for Wednesday’s meeting was the launch of a book, State of Terror by Thomas Suárez, published by Skyscraper Publications, on the role Jewish terrorism played in the transformation of Palestine into Israel. In his introduction, Karl Sabbagh, whose father was Palestinian, pointed out that long before internet trolling, anyone who wrote in public in support of the Palestinians would face an organised barrage of hostile and abusive letters or emails, often expressed in identical terms and quoting from Israeli embassy propaganda. He quoted three specific examples of medical journals which published pieces about Israeli violence against Palestinians and were subject to abuse from the Israel lobby and pressure placed on proprietors to fire editors. In one case, World Medicine, the onslaught led to eventual closure of the magazine. * For more information regarding media usage, ownership and rights please contact Skyscraper Publications.